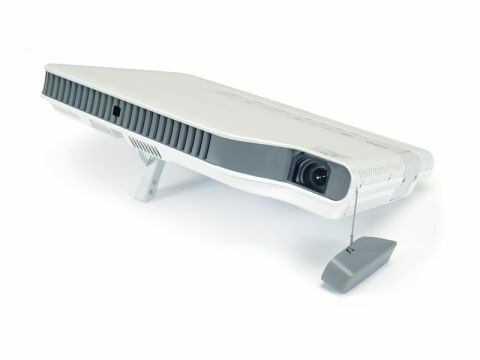 Is the Casio XJ-A135 LED powered DLP projector worth the premium? Projectors with LED technology have taken a while to reach the mainstream. The first few pico-projector products were frankly unimpressive, with limited resolution and brightness. Casio has taken a different tack with the technology, pumping up its projector's output power to match that of conventional bulb-based units, but retaining the benefits of relatively small size, robust build quality and long life. The XJ-A135 isn't a gimmicky pico-gadget – it's a fully-fledged professional unit that boasts mains power, comprehensive connection options and Wi-Fi. It's about half the height of a standard bulb projector and is roughly the size of a sheet of A4, making it a practical choice for use on the road, although at around 2.3kg it's no lighter than its standard counterparts. The light source is a hybrid design that uses a bright LED for red output, a laser diode for blue and a phosphor converter to convert the blue to a bright green. The source is solid-state, so there's no cool-down time, and extended life is a key selling point. The bulb in a typical standard projector has a rated lifetime of 2,000 to 3,000 hours, and can cost around £250 to replace when it fails. Casio suggests that its laser and LED light source can last up to 20,000 hours, but if you read the small print you'll notice that it's officially rated for 6,000 hours, or three years. After that it may start to dim, or the colours may shift. Replacing a filament bulb is a five-minute DIY job, but you'll need to send the Casio back for a refit to replace the solid state source, which may not be ideal, and prices for the replacements aren't yet available. This matters because the device's main selling point – the suggestion that you can save money in the long run due to not having to replace bulbs on a regular basis – isn't quite as clear-cut as it first seems. But what about its performance? In testing, the nominal 2,000 ANSI lumens were bright enough to be visible in daylight. Contrast isn't exceptional, and it took some fine-tuning to balance solid blacks against brighter colours. There's a range of colour balance options for video, whiteboard, gaming and general display, which all shift the nominal white point in a number of subtly tinted directions. Settings for individual RGB levels are also available if you want custom control of white balance. By default, pure greens may appear more luminous than you're used to, while blues are slightly understated. Although it was possible to get natural-looking flesh tones from photos with careful tuning, the lack of absolute contrast makes this an unlikely choice for home cinema enthusiasts. This device is likely to spend most of its time displaying PowerPoint slides, and visual quality is more than adequate for the business market. The nominal 1024x768 resolution is on the low side, especially at the price, but the range includes models with a resolution up to 1280x800 and 2,500 lumens. Other features include built-in Wi-Fi to eliminate the need for cables, HDMI for direct video input, and a USB socket. The Wi-Fi uses a separate free server application installed on your PC, which mirrors your main monitor port. Unfortunately it also co-opts your PC's Wi-Fi, which means you can't use the projector to display websites unless your PC has a separate Ethernet connection. Static PowerPoint slides display with no problem, but a high-speed mode for video was less successful. But you may not need a PC at all, because the software bundle also includes a media converter that can bundle your PowerPoint classic into a single file that can be saved to a USB stick and plugged into the back of the XJ-A135. The converter is drag-and-drop no-frills, and does the job as long as you use standard video and image file formats. Overall, this is an interesting and welcome new technology. Although it seems pricey, even with the nominal bulb savings, it's a likely choice for road warriors who need a robust and slim unit, and for offices where projectors are used all day, every day.